Brands, are you targeting these 3 travel personas? The year end festive season is always the peak period for travel and there will always be various travel personas, especially in a diverse region such as Southeast Asia. According to Xaxis, which surveyed 7937 individuals in the region, there are three different travel personas in Southeast Asia – young parents, holiday seekers and experience seekers. School holidays largely dictate the travel dates and flexibility of young parents. Xaxis describes this group to be cautious and time poor travellers with young children. 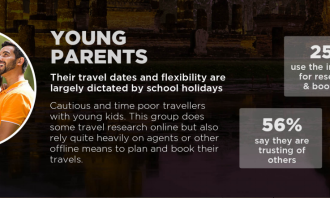 While young parents conduct online travel research, with 25% of young parents who responded using the internet for research and booking, they also rely quite heavily on agents or other offline means to plan and book their travels. According to Xaxis, 68% are urban dwellers and 56% of young parents are trusting of others. 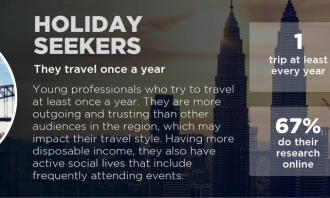 Holiday seekers are young professionals who travel at least once a year, and are more outgoing and trusting than other travellers in the region. According to Xaxis, this may impact their travel style. Having more disposable income also allows them to lead active social lives, that include frequently attending events. About 70% of the young professionals surveyed frequently attend music events and 65% attend sports events. 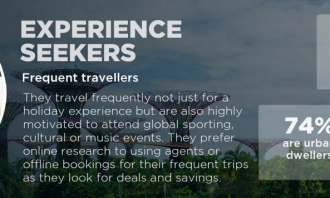 Experience seekers are frequent travellers who not only travel for holidays but are also highly motivate to participate in global sporting, cultural or music events. Approximately 70% of the experience seekers surveyed are employed full-time and 74% are urban dwellers. About 37% of experience seekers frequently research or book their travel online. According to Xaxis, this is because experience seekers look out for deals and savings. “The travel audience in SEA are mostly urban (65%) and many of them research and make bookings online (62%). However offline media such as TV, radio and newspaper still plays an important part in the decision making process, with 45% of travellers consuming offline media frequently,” Apurva Prasanna, manager, insights and analytics, said. “Travellers in Southeast Asia like to attend events, with music and sports events being highly popular as travel reasons too. So there is definitely a pattern where frequent travellers attend music and sports events frequently. Southeast Asian travellers in the region are mostly outgoing and trusting based on persona types that we have identified when we took a closer look to identify the different travellers,” Sherin Philips, senior analyst, insights and analytics, said. The modern Muslim traveller: Still an untapped segment? Foodpanda.my has expanded its food deliver service to residents of Johor Bahru, following its positive response and success in the..
Annouchka Behrmann will lead the firm’s marketing team with responsibility for strengthening existing relationships as well as bui..